Abrogated the Treaty of Friendship and Commerce Between the United States and the Government of the Samoan Islands of 17 February 1878 (20 Stat. 704; TS 312; 1 Bevans 437). Abrogated the Treaty of Berlin of 14 June 1889 (26 Stat. 1497; TS 313; 1 Bevans 116). 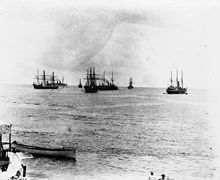 The Tripartite Convention of 1899 concluded the Second Samoan Civil War, resulting in the formal partition of the Samoan archipelago into a German colony and a United States territory. Forerunners to the Tripartite Convention of 1899 were the Washington Conference of 1887, the Treaty of Berlin of 1889, and the Anglo-German Agreement on Samoa of 1899. By the 1870s modern economic conditions were well established and accepted by the Samoans, who had just enough of a government that could be manipulated at will by the foreign business interests in Samoa. After the United States concluded a friendship treaty with Samoa in 1878, Germany negotiated her own Favorite Nation Treaty in 1879 with the same Samoan faction as the U.S., while later in 1879 the Anglo-Samoan treaty was completed with a rival faction. Contentions among the whites in Samoa, plus native factional strife led to side-choosing that became deadly warring with the introduction of modern weapons. To attempt to resolve some of the problems, the United States, Germany, and the United Kingdom agreed to a conference at Washington in June 1887. After the surfacing of serious disagreements among the parties, the conference adjourned without results. Fighting by nationals of the three powers with their factional local allies led to a conflict that was only tempered by the Apia hurricane of 1889 that wrecked warships on the verge of hostilities. No sooner was the native royal figurehead appointed, and after disturbances restored, the other chiefs went into rebellion and civil war ensued. By the end of the 19th century, the failure of the arrangement was freely admitted by the governments of the three powers since the principal protagonists in Samoa acted directly for their own interests, frequently overruling the officials of the condominium. A dissolution of the condominium created by the "entangling alliance" was now in play. These treaty arrangements of the Tripartite Convention of 1899 stayed in place until the outbreak of World War I in 1914. ^ The United Kingdom was then embroiled in the Second Boer War and therefore viewed as in a weakened bargaining position [Coates, Western Pacific Islands, p. 230], however, the German desire to rapidly conclude the negotiations and bring the western Samoan islands into their colonial empire, had a balancing effect that was clearly evidenced in the agreement as signed. ^ The United States Department of State was informed on 9 November 1899 through the U.S. embassy at Berlin that foreign minister Count Bernhard von Bülow expressed the hope to the U.S. chargé dʻaffaires that the Anglo-German "agreement would meet with the satisfaction of the United States," since according to the agreement, "... not only Tutuila would become the property of the United States, but also the smaller islands" of the Manua group [Ryden, p. 571]. ^ Beginning with the American-Samoan Friendship treaty of 1878, to the Washington Conference of 1887, to the Berlin Conference in 1889, and finally to the Tripartite Convention of 1899, the United States held a consistent position, if not always publicly, to acquire the coaling station at Pago Pago Bay. It was the probability of building a canal in Central America that defined this American perspective. ^ Swains Island, a privately-owned atoll in the Tokelau group, became officially part of American Samoa by annexation on 4 March 1925. Coates, Austin. Western Pacific Islands. London: H.M. Stationery Office. 1970. Gilson, R. P. Samoa 1830-1900, The Politics of a Multi-Cultural Community. Melbourne: Oxford University Press. 1970. Gray, J. A. C. Amerika Samoa, A History of American Samoa and its United States Naval Administration. Annapolis: United States Naval Institute. 1960. Townsend, Mary Evelyn. Origins of Modern German Colonialism, 1871-1885. New York: Vol. IX of Columbia University Studies in History, Economics, and Public Law. 1921.